Daikin is a brand that acclimates to any setting. With top-of-the-line air conditioners and heat pumps, Daikin has products for any room or household. They carry single-zone, multi-zone and whole house units. Daikin’s single zone units are ductless and great for heating and cooling small homes or individual rooms that need special attention. These units elevate the air in your smaller spaces and can also be used to supplement your current system. The multi-zone units are also ductless and connect multiple rooms to give you the feel of central heat and air. They are easy to install and only require one small outdoor unit to operate. Daikin’s whole house units provide unprecedented efficiency with results that will save you money on your monthly bills. As some of the most advanced products on the market, these units will provide precise heating and cooling in your home for years to come. They are easy to install and maintain, and offer a high level of control and elegance. 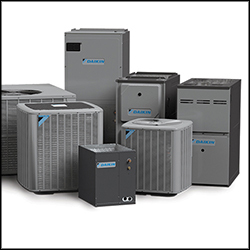 For more information about Daikin air conditioners and heat pumps from Pro-Tech Heating & Cooling, please contact us here or call us directly at 616.453.5000.